Umphrey's McGee | Virginia Credit Union LIVE! After 17-plus years of performing more than 100 concerts annually, releasing eight studio albums and selling more than 3.5 million tracks online, Umphrey’s McGee might be forgiven if they chose to rest on their laurels. But then that wouldn’t be consistent with the work ethic demonstrated by the band, which consistently attempts to raise the bar, setting and achieving new goals since forming on the Notre Dame campus in South Bend, IN, in 1997. After releasing their eighth studio album, Similar Skin, the first for their own indie label, Nothing Too Fancy (N2F) Music (distributed by RED), the group continue to push the envelope and test the limits. Their brand-new studio album, The London Session, was a dream come true for the members having been recorded at the legendary Studio Two at historic Abbey Road. The stealth recording session yielded 10 tracks in a single day, proving once again, the prolific UM waits for no one. The original Umphrey’s McGee played a mix of originals and cover songs, waiting just eight months to release their debut album, the cheekily titled Greatest Hits Volume III. Their initial “proper” recording, Local Band Does OK, came out in 2002, followed shortly afterward by an appearance at the first-ever Bonnaroo in Tennessee, selling more albums than any other band on the bill. The 2007 double album, Live at the Murat, earned a four-star review in Rolling Stone and a Jammy for Best Live Album. Despite attempts at categorizing UM, the band has devoted its craft to making their devoted followers feel as if they are part of something larger, through such technology-fueled innovations as fan-curated sets, the immersive high-end audio offering, “Headphones & Snowcones,” where the pristine sound of the live soundboard mix is piped wirelessly through high-end personal monitor systems and headphones, as well as making every live show since 2005 available via their live music portal UMLive.net. UM were also the first group to launch its own single-artist streaming service. Last year’s Similar Skin saw Umphrey’s McGee aim to strut their rock and progressive roots, with touchstones ranging from the Police and U2 (“The Linear”), the Beatles (“No Diablo”), Nirvana (“Loose Ends”) and Led Zeppelin (“Hindsight”) to Metallica, Soundgarden and Pantera (“Puppet String”) and even the symphonic rock of Gentle Giant, King Crimson, Yes or Genesis (the closing nine-minute live staple, “Bridgeless,” finally committed to record). “Every night, we have the opportunity to play whatever and however long we want,” says singer/guitarist Brendan Bayliss. 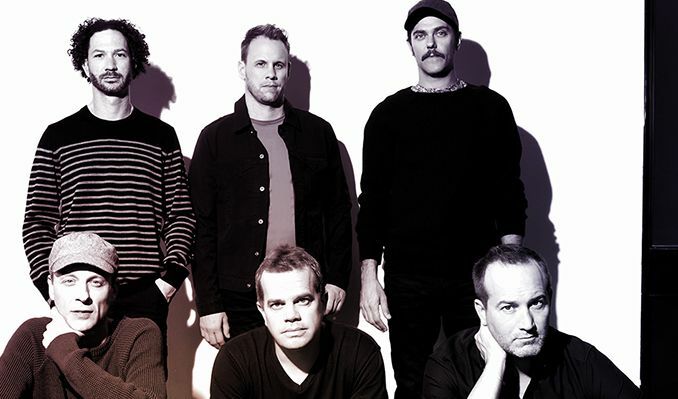 Going into the studio, the challenge was to be as concise as possible, to trim all the fat we could.” Recorded at IV Labs in Chicago between tour dates, Similar Skin was produced by Umphrey’s McGee themselves as “a coherent vision,” featuring plenty of dynamics and contrast, with many of the songs coming from their live repertoire. Thematically, Bayliss was inspired by his own fatherhood, tackling such issues as living in the moment (“The Linear”), his own mortality (“Cut the Cable,” “Hourglass”), having children (“No Diablo”), the things that bring us together (“Similar Skin”), the question of whether there is a God (the Ryan Stasik slap-bass-driven “Puppet String”), sleep-walking (“Educated Guesses”), the art of storytelling and, according to Brendan, “unresolved psychological issues from the past” (“Loose Ends”). Finding themselves in London last June for three shows at the Brooklyn Bowl, the idea of recording at Abbey Road was first proposed by Umphrey’s producer Manny Sanchez, a notion, as Bayliss recently told Rolling Stone that seemed as likely as “being asked to give a sermon at the Vatican.” “It wasn’t a goal,” he explains, “because it never seemed like a possibility.” But never to be bound by what seems possible, UM secured a coveted day at the world’s most famous recording studio and dove in headfirst. The first songs Umphrey’s McGee recorded that day were altered acoustic arrangements of “Cut the Cable” and “No Diablo,” from Similar Skin. “Something we could go in and get quickly,” according to Brendan. “Bad Friday,” a song the band debuted live in Denver the previous New Year’s Eve and “Comma Later,” a song described by Rolling Stone as “smooth R&B menace with Jeff Beck-styled lead guitar” – was another recent original, recalling the Rock and Roll Hall of Famer’s Wired album was also recorded at Abbey Road under its cathedral-high ceiling. “It makes one note just fold over and over again, coming back around,” marveled guitarist/ vocalist Jake Cinninger, who ventured into the original microphone closet, where he discovered all the Neumann and Telefunken mics The Beatles used still in pristine condition. “You can hear the echo in the room. The notes keep singing operatically.” “Glory,” “Eat” and “Out of Order” were three set-list regulars that had never been recorded for a studio release. With time still left on the clock, the band decided to cut The Beatles’ “(I Want You) She’s So Heavy,” for their own entertainment, but ultimately ending up including on the album. Twelve hours after first setting foot in Abbey Road Studios, just before midnight, Umphrey’s McGee left the historic room with their own new album, The London Session, what Rolling Stone dubs “a historical primer, an evolution story inside 51 minutes.” “You’re looking at 17 years of change,” says Bayliss. “We managed to capture a good representation of our spectrum.” Umphrey’s McGee are more than just a rock band – through nearly two decades, they have proven to be on the cutting-edge of both music and technology, super-serving their fans through a community that stretches from the campus of Notre Dame to the hallowed halls of Abbey Road.